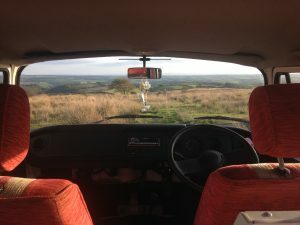 In late September I picked up my T2 new Bay VW Camper Van from a farmyard in Porlock and drove back over Exmoor. Caught up in something of an emotional mix; in shock one moment, hysterically laughing and grinning the next… and kangaroo hopping the van towards home. 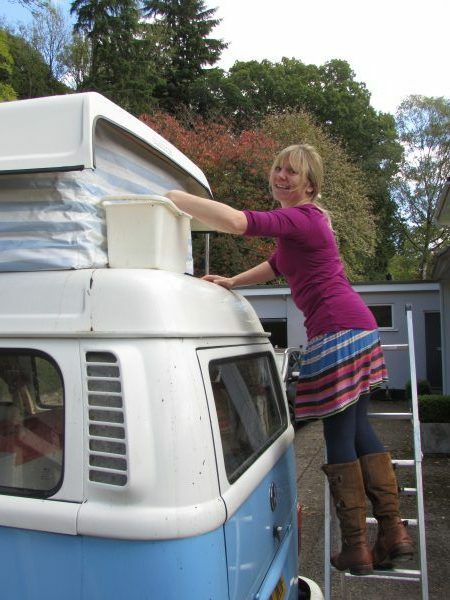 One of my lovely Willow Sculpture Day students, (now partially immortalised in the name of my camper), had suggested that his van, very loved but under used, might just be the vehicle that I need to cope with increasingly overnight stays away whilst teaching and to add zest to my life! 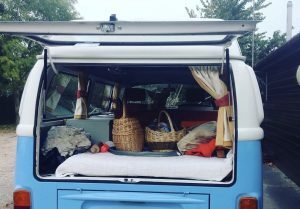 Until that moment I had never considered that I would become a VW camper van owner, let alone quickly fall in love with its practicality and… its idiosyncratic charms. I quickly realised that ‘Nigella’ my camper van could become a whole lot more. Teaching, commissions and having the time to practice my basket making is quite a balancing act. The idea struck me that my camper van’s tired but perfectly functional interior could become a showcase for traditional English basket making techniques. 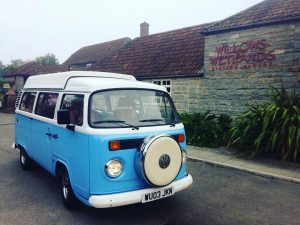 That as I wove my willow teaching adventures across the UK my camper van could promote English basket making, and furthermore, through creating a bespoke willow interior concentrating on white willow square work I would be able to practice, practice and practice some more! 15 hours of cleaning and waxing later, (although I do still have some stubborn Porlock spiders who refuse to leave their residence), my camper van has emerged an absolute gem! Having never driven a T2, let alone a VW van before, I’m learning that it’s akin to being in, (or out of), tune with a living breathing machine. I love the way Nigella will let me know when she’s fed up with being in a traffic queue by seeming to rev her engine all on her own and the way that she will defiantly let me know that 57mph is far better for her soul than 63mph! Yes I do still need to get a working heater in the van, (especially carrying freshly prepared bundles of willow that exude moisture), but having a non-electronic, air cooled ‘phat phat’ sounding van is just great! So far we’ve conquered commutes to teaching Willow Sculpture Days at Coates English Willow, bounced up the Cheddar Gorge on our way to teaching a school workshop in Bath and managed to sleep and then drive, (being well rocked during both), through storm Callum. I’ve been totally convinced that she’d utterly broken-down after accidentally knocking out the pin holding the accelerator pedal in place and not realising that I was parked in gear. In my defence using the gear stick is as they say like stirring porridge with a large unwieldy spoon and I was very tired…. Then I’ve also seen so many smiles on fellow driver’s faces as they wave to me. Nigella brings a mixture of joy to people young and old, and no doubt frustration if you are meeting her from behind! And why is she really called ‘Nigella’? Well apart from assuming her name partly from her former owner and for being the bright blue colour of ‘Love-in-the-mist’, a flower also known as Nigella; I reckon she may turn out to be reminiscent of a certain champion of home cookery, perhaps high maintenance but deliciously worth it! ← Can you spot the Willow Deer at River Cottage?